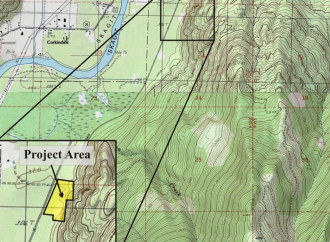 Following is the text of a detailed letter signed by residents and property owners in the greater Rockport area expressing the expectation that the Barnaby Reach habitat restoration project be subjected to risk assessment criteria commensurate with its high risk location adjacent to a residential and farming community. 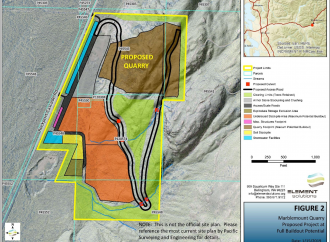 Hard copies with signatures were given to project sponsors and partners and members of the Barnaby Reach Advisory Committee at a meeting on September 28, 2015, in Marblemount, Washington. Other addressees will be sent email copies of this letter, which is intended for all individuals and organizations who may have a role relating to the project’s design, development, funding, permitting, or political and regulatory review and approval. The undersigned residents, property owners and concerned neighbors in the greater Rockport, Washington, area hereby express their strong desire and expectation that the Barnaby Reach salmon habitat project under development by the Skagit River System Cooperative and its partners be thoroughly evaluated against extra-conservative, catastrophic event criteria in its design and development phases, and in the course of review by political, funding, and regulatory agencies and authorities, to assure that it will not result in any flooding or flood risk to neighboring properties under any circumstances which could be associated with the project. The Skagit River System Cooperative, on behalf of the Swinomish Indian Tribal Community and the Sauk-Suiattle Indian Tribe, together with its organizational partners, Seattle City Light, The Nature Conservancy, and the Washington Department of Fish and Wildlife, are developing a project in the Barnaby Reach area of the Skagit River which aims to improve salmon habitat in and around the Barnaby Slough. This ambitious and complex environmental development project currently envisions dramatic modifications to the local landscape in close proximity to a residential and farm community. 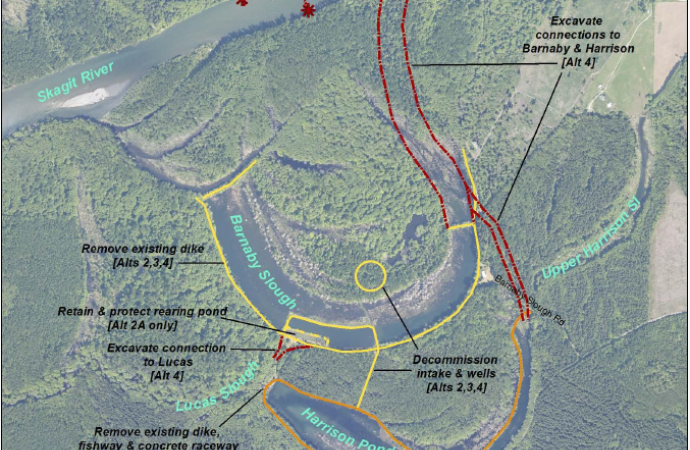 For example, the project anticipates construction of a wide, deep and lengthy channel intended to divert significant Skagit River flow southwestward into the Barnaby Slough and out of it back into the Skagit River. Under certain environmental as well as catastrophic circumstances the channel could contribute to a major shift in the Skagit River or result in significantly greater river diversion. In fact, as much as all of the Skagit River could divert through the channel and the channel could lead to a major shift in the route of river across the valley floor. River blockages, landslides and earthquakes are examples of circumstances and events that could put neighboring homes and properties in danger as a consequence of the project and its features. The 100-year flood history is an entirely insufficient criterion for evaluating this project given its high risk location near a residential and farming community. Far more conservative criteria should be employed which reflect all negative possibilities which could lead to flood damage as a consequence of any project feature like the envisioned channel. We ask that the Barnaby Reach project partners and all the members of its steering and advisory committees, as well as all governmental officials and authorities who have or will have a role in reviewing and evaluating this project seriously engage the unaddressed risks inherent in this project and act to assure that this project cannot lead to flooding of neighboring properties and that it will pose no increase in flood risk in our community. 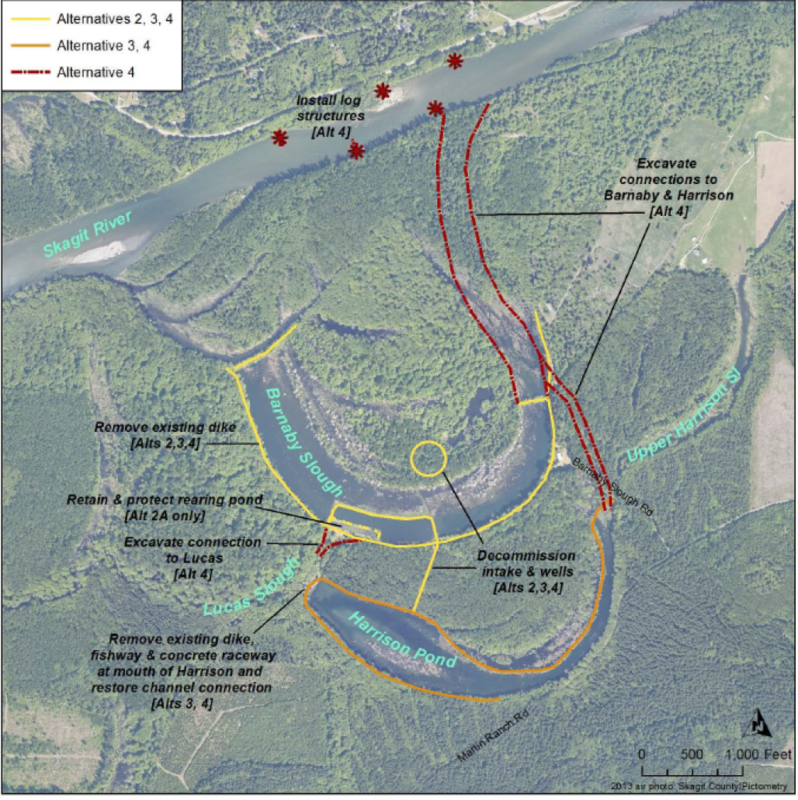 The multi-phase project is in its second phase, following completion of analysis and study intended to identify and preliminarily assess possible project alternatives. The project partners have tentatively selected what they call “alternative #4,” the most ambitious of their identified options, and are now in the process of carrying out more thorough, detailed study and analysis to refine their project into a more definite development plan. With respect to flood risk, the project sponsors have accomplished some computer aided modeling to assess flood consequences using 2-year and 100-year historical flood levels as well as other hydrological boundary conditions. Their findings based on these assumptions of fact show minimal flooding. The alternatives under consideration essentially involve removing the features of an abandoned hatchery facility and opening bounded water spaces to facilitate fish passage. However, the far more ambitious alternative favored by the partners, “alternative #4,” includes design features which, by their construction, will create the potential for flooding in the event of any of a number of possible events. 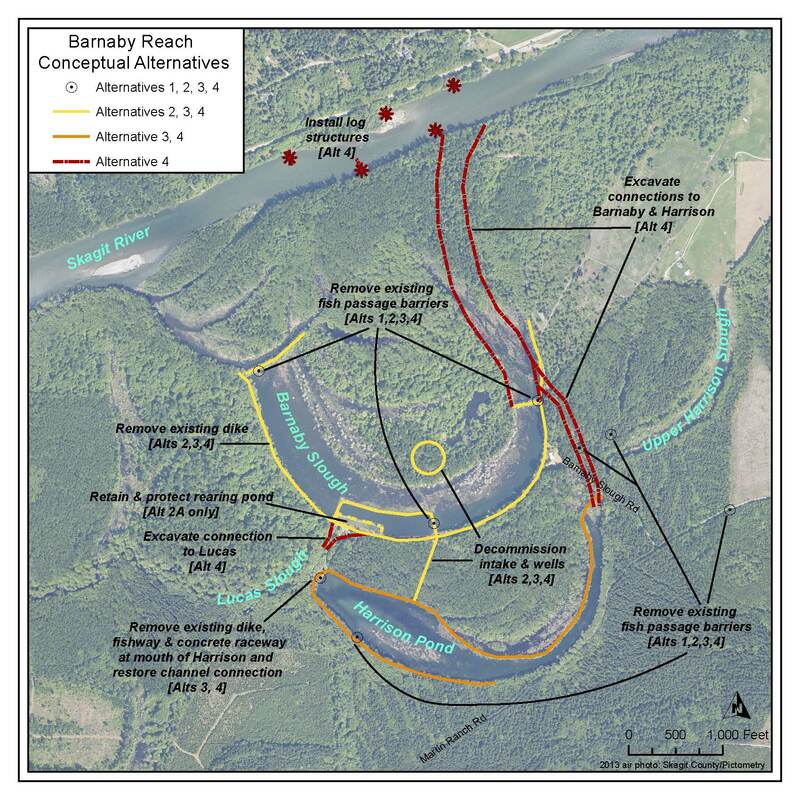 Alternative #4 as presently imagined includes a wide, deep channel (270’ wide by 10’ deep) upstream of the Barnaby Slough to divert a portion of the Skagit River into the Barnaby Slough, along with an exit channel from the Barnaby Slough back to the Skagit River. The negative possibilities associated with this channel have been insufficiently addressed thus far. Though a certain volume of flow is intended, the southwestward directed channel will present the Skagit River with the opportunity to change direction and flow diagonally across an essentially flat plain and put homes and lands in harms way. Everyone with an intimate familiarity with the behavior of rivers knows that river behavior cannot be completely controlled and that significant developments like this can result in undesirable and tragic consequences. There are many homes, farms and ranches in harms way. 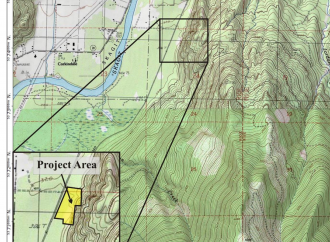 Because this environmental development project is planned in an area immediately adjacent to a significant population of homes, farms and ranching operations, as well as forestry businesses, this project should be evaluated relative to far more conservative criteria than the 100-year historical flood levels. The changing regional climate further renders the historical flood record insufficient. And, the potential for flooding as a consequence of catastrophic events because of the creation of the channel must also be taken into consideration. Catastrophic events include but are not limited to landslides, earthquakes and dam failures. 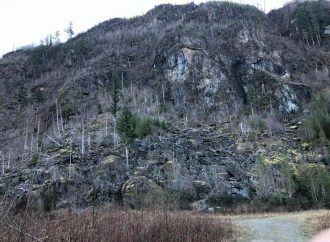 Even non-catastrophic developments, such as river and exit channel blockages may result in a much greater amount of Skagit River flow diverting into the channel. Such events have not been sufficiently considered. 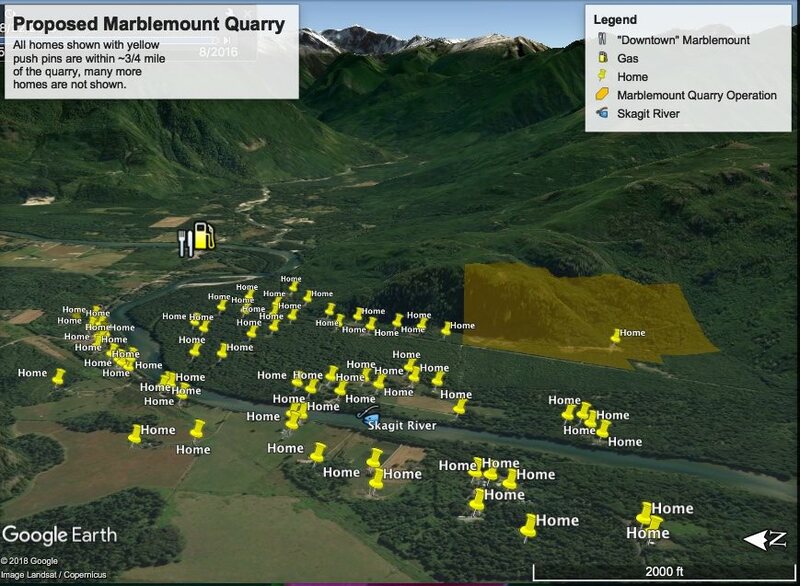 If the Barnaby Reach project includes a man-made channel of any significance intended to divert Skagit River flow into the Barnaby, then the project must be evaluated and its integrity assessed relative to extra-conservative criteria to put our minds at ease that such a development will not and cannot result in any flooding to neighboring properties. way to go, Dave! I agree that the folks at FEMA need to be in this loop sooner than later.